In this full-length video lesson, viewers learn how to paint a dramatic bird's nest scene. To create this background, we use the FolkArt Blending Gel which allows for more time to get the painting just right before it dries; a dry brushing technique; and we're also introduced to palette knife painting. This painting lesson dives into the hardest part first, challenging painters to accomplish a seamless gradation of color from dark to light. Andy Jones, Content Editor of our online educational program, Let's Paint, expertly guides the most inexperience painters through a piece they would be proud to call their own. 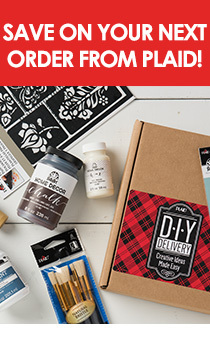 Plaid makes it easy to start painting and created the FolkArt Studio Series Let's Paint kit. The kit includes 17 FolkArt Acrylic paint colors, FolkArt Treasure Gold, 18 FolkArt paintbrushes, FolkArt Blending Gel, Plaid Brush Basin, Exclusive 38-page pattern pack. Purchased separately, kit components would retail for $149.99.